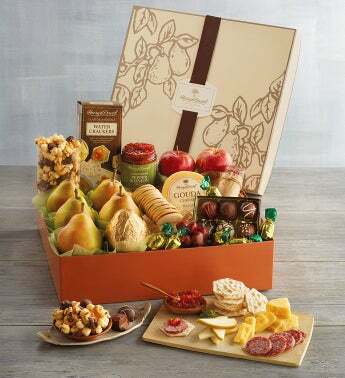 Send a gift brimming with Southern Oregon favorites. There's plenty to share, including extraordinarily juicy Royal Verano® Pears from our orchards and irresistible Moose Munch® Premium Popcorn from our candy kitchen. There are lots of tempting savory snacks as well, like our signature pepper and onion relish and Gouda cheese and crackers for snacking.